Lodging Web Designers for Inns, B and B's, Hotels, Motels. 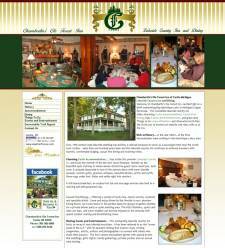 Featured here is Chamberlin's Ole Forest Inn. Step inside this premier Upper Michigan Inn and enjoy the warmth of the lobby's ten-foot stone fireplace. We enjoy building beautiful Websites for Accommodations around the country. Click title above to visit website. 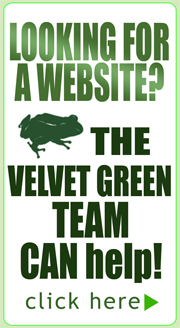 Hotel Web Designers for Franchises around the country. Americas Best Value Inn of Newberry Michigan is a full CMS website that the user can update from any computer in the world. The site provides information on the hotel itself but also acts as an information center for the Tahquamenon Country Area surrounding its location in Newberry Michigan. Click title above to visit website. Hotel Web Designers for hotel owners around the country. The Cherrywood Lodge of Munising Michigan - Welcomes You to world class snowmobile lodging! This website is a full Content Management website where the user can update content, add pages, delete pages, from any computer in the world. This site was formerly the Best Western of Munising and needed a quick change-over after changing its name. Click title above to visit website. 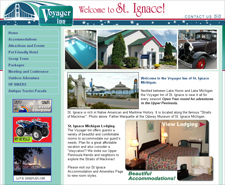 The Voyager Inn of St. Ignace website is a fully self maintained website devoted to lodging and activities in the St Ignace, Michigan area. Click title above to visit website. 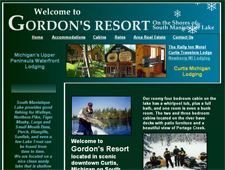 Resort Web Design for a beautiful Resort Web Site on the lake! Located in the unique fishing village of Curtis, Michigan. This resort web site features two additional properties to browse! Click title above to visit website.